WPSA SIngles And Doubles Star Thomas Earl Page, whose extraordinary talent and charm captivated the North American squash world from the late 1970's to the early 1990's but who battled personal demons for much of his life, died April 28, 2001, at the grievously premature age of 44. Winner of the U. S. Nationals in 1977 as a precocious 20-year-old Princeton sophomore, Page went on to capture numerous titles in both singles and doubles and became one of the most popular performers on the WPSA Tour throughout its glory days of the 1980's. 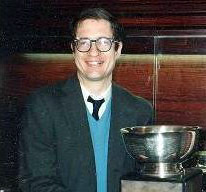 During an era that featured such luminaries as Sharif Khan, Mark Talbott, Ned Edwards, Stu Goldstein, Michael Desaulniers, John Nimick, Mario Sanchez, Todd Binns and Kenton Jernigan, Tom was perennially ranked solidly in the top ten, posted multiple victories over every North American top-echelon player and displayed a verve and flair that made him, at his best, arguably the most charismatic and entertaining player on the entire tour. One of the most compelling spectacles in all of sport during that period, fully the visual equal of Pavel Bure racing down the ice on a breakaway or Magic Johnson spearheading a Laker fastbreak, was that of Tom Page flying recklessly around the squash court, his legs powerfully churning across the court as he made multiple eye-catching retrievals of an opponent's would-be winners. In addition to this mobility, Page also could create enormous pace while still possessing exceptional touch, especially on his backhand three-wall, which he often directed into the nick with uncanny precision. A member of the famed Merion Cricket Club junior program in suburban Philadelphia, Page starred as a junior on his undefeated Episcopal Academy high-school team on which his older brothers, Palmer and David, each a future college all-American, also played prominent roles. Tom's first explosion onto the Open squash scene came in the 1977 North American Open, when he stunned the squash world by handily defeating two recent National Champions on his way to the semis, where he led Sharif Khan (who had won seven of the previous eight Opens) 9-8 in the fifth before yielding to The Champ. This sparked a torrid surge that culminated in the National amateur title in Chicago the following month. After turning pro a few years later, Page again electrified the squash scene in the opening event of the 1980-81 WPSA season, his first full season as a pro, when he sequentially upset Aziz Khan, Mario Sanchez, Sharif Khan (all in three games!) and Clive Caldwell to win the tournament. Two years later, again in the season-opening event, he faced top seed Michael Desaulniers, who had overwhelmed the tour throughout the previous spring while rocketing to the No. 1 ranking, and upset him in five, thereby puncturing the growing myth of Desaulniers's invincibility. But perhaps Page's greatest performances came against Jahangir Khan, who throughout that mid-80's stretch was completely dominating both the hardball and softball games. Jahangir later insisted that by far the adversary, hardball or softball, who posed the stiffest challenges to him during that period was Tom Page. Though the indomitable Jahangir always emerged victorious, Page invariably played his best squash in their matches, and the noteworthy contrast in their styles--Jahangir error-free, conservative and with perfect fundamentals of stroking and footwork, Page adventurous in his shot selection and evincing a flair for the dramatic, the world's greatest all-time player against America's most gifted natural talent--made for riveting entertainment, as did the tendency of their matches to go the full five games. The climax of their rivalry was a quarter-final battle on a portable three-glass-wall court in the off-Broadway theatre Town Hall in the 1985 North American Open, an air-sucking rubber-burning punch-out replete with a seemingly unending stream of pulsating all-court points which Page, after hitting a savage backhand winner at 17-all in the third to go up 2-1, appeared positioned to win. Though he bent just enough beneath the unrelenting Khan ground attack to surrender the final two games to his all-conquering foe(who went on to win the final two rounds handily), Page with this performance had co-authored what might have been, given the ferocious athleticism of the play and significance and grandeur of the setting, the esthetic masterpiece of the WPSA's entire history. Tom was never able to approach, much less duplicate, this performance in the years that followed; in fact, in the next event a few weeks later, he lost in the early rounds to a lower-ranked opponent, a fact which seemed to symbolize the difficulty he had throughout his career in finding the consistency that characterized the play of those ranked ahead of him. Always in the top ten, he never was able to reach the top five and the resulting frustration, as well as the burden of extremely high expectations he always had to carry and the toll exacted from the cumulative effect of a series of minor but nagging injuries, prevented him from ever winning one of the pro game's handful of major singles championships. Doubles was a different story--throughout the late 1980's, he won major titles with a number of partners and playing both the right- and left-walls. Though he won the 1985 WPSA Doubles Team Of The Year Award with Michael Pierce, his greatest and most long-standing alliance was with Todd Binns, with whom he teamed to win this Award three straight years in the late 1980's; in their best season, 1987-88, they lost only one match, in the finals of the last tournament of the season. Tom's career, like his life as a whole, was a series of highs and lows, but he was always known as a clean player, the personification of good sportsmanship, win or lose, and a hail-fellow-well-met with a good sense of humor and a good heart. He made a major positive impact on the North American squash world for the better part of two decades, and he will be fondly remembered and sorely missed by his numerous friends as they mourn a life that ended all too soon.